Monsignors Adam J. Parker and Mark E. Brennan, who will serve the Archdiocese of Baltimore as auxiliary bishops, met the public as bishops-designate for the first time Dec. 5, first at a morning press conference and then at mid-day Mass at the Basilica of the National Shrine of the Assumption of the Blessed Virgin Mary in Baltimore. 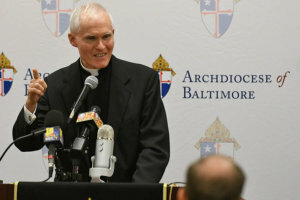 “This is truly a joyous day in the life of the Archdiocese of Baltimore,” Baltimore Archbishop William E. Lori said at the press conference at the Catholic Center, in Baltimore, as he introduced the two men. Bishop-designate Parker, who has served as vicar general and moderator of the curia for the archdiocese since 2014, acknowledged that substantial chatter had preceded his appointment. 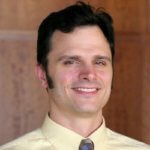 “Well, my friends, it just goes to show – sometimes the rumors are actually true,” he said. He expressed joy in the fact that, as a bishop, he will serve as a successor to the Apostles, who, he noted, were not chosen for their intellect or other earthly skills. “They were simple men with sincere hearts, willing to follow wherever the Lord would lead them,” he said, adding that they took to heart Christ’s final exhortation to “go make disciples,” a phrase he will adopt as his motto as bishop. Bishop-designate Parker said that he would be “accompanying people where they are,” per Pope Francis’ wishes, and he asked all to accompany him as well. 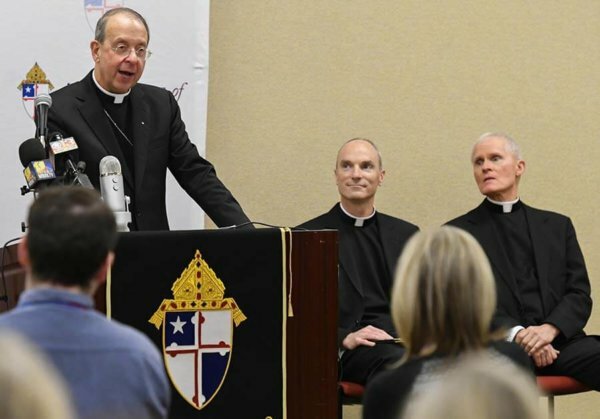 “That is my hope; that is my prayer; that is my request, for you today,” Bishop-designate Parker said at the press conference, at which were many Catholic Center staff who have worked with him. Bishop-designate Brennan, who will turn 70 Feb. 6, said that he had been expecting to finish his ministry as a pastor, St. Martin of Tours in Gaithersburg, a parish of the Archdiocese of Washington. The bishop-designate was the Washington Archdiocese’s vocations director in the 1990s, and he noted that the Baltimore Archdiocese’s work in that area – Quo Vadis vocations camp, for example – is solid. Archbishop Lori noted at the press conference that the Vatican had officially accepted the resignation of Bishop Denis J. Madden, auxiliary bishop of Baltimore. 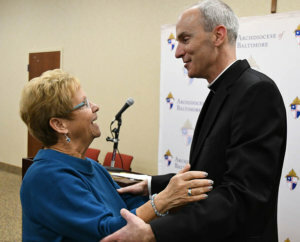 Archbishop Lori was asked whether the archdiocese’s current vicariate system – which divides the archdiocese into the St. John Neumann Vicariate and the St. Elizabeth Ann Seton Vicariate – would remain. “We’re looking at that right now,” the archbishop replied, mentioning that the archdiocese continues the pastoral planning process that he announced with his 2015 pastoral letter, “A Light Brightly Visible: Lighting the Path to Missionary Discipleship,” and began in earnest this year. 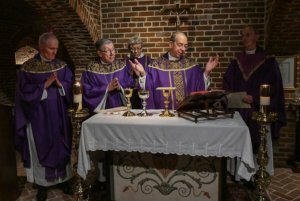 After the press conference, the bishop-designates concelebrated Mass with the archbishop, as well as Bishop Madden, in the Basilica undercroft. Also concelebrating were Monsignor James W. Hannon and Father William Foley of the archdiocesan office of clergy personnel. In his homily, Archbishop Lori noted that Advent is a season of waiting. The Gospel reading, Luke 5:17-26, which told the story of men lowering their paralyzed friend through the roof to meet and be healed by Jesus, illustrated the work ahead for Bishops-designate Brennan and Parker, the archbishop said, noting that the men in the Gospel were so moved by Jesus that they took extraordinary measures to put their friend before him. For more photos from the news conference and Mass, visit our Smugmug page. For video highlights from the press conference, click here.